Soccer training has never been so smart! Adidas demonstrated, once more, that instead of the spread belief that technology separates people from sports practice, it can actually be an enormous aid. Not only does it make sports practices more appealing, but also provides an invaluable training help. This latest released Adidas miCoach Smart Ball provides detailed information that reflects the current performance of a soccer player, and the needed data to analyze and improve his or her performance. Here it is to smart training. Read on my Adidas miCoach Smart Ball Review and find out if you are ready for smart and competitive training! What is the miCoach Smart Ball and what does it do? The Adidas miCoach Smart Ball is a quite peculiar ball. It integrates a series of sensors that will obtain details from your performance, which such details you will be able to focus your training on the needed aspects. Adidas started working on the Smart Ball back on 2009, aiming to help soccer players improve their performance. Though professional soccer clubs still seem reluctant to integrate officially the smart ball to the training sports gears, the German company intends to see it become a tool of personal formation. The ball was designed to improve dead-ball kicks, game-ball situations such as free kicks, shots, penalties, corner kicks, long passes or goal kicks. The idea is as simple as effective: knowing how players hit the ball, they will be able to ameliorate their technical play. Was the first question that I asked myself when I started this Adidas miCoach Smart Ball Review. Basically, what makes it unique is that it looks and feels like a regular ball though it provides a wealth of useful information. If you see the miCoach Smart Ball among other soccer balls, you will just see another Adidas brand ball, with its quality leather, renown logo, and black and white matte finishing. In fact, it was manufactured following the same quality standards as the final cup balls and it fully conforms to FIFA’s standards for official soccer balls. Grab this size 5 smart ball and realize it weighs as any regular soccer ball. This is of particular importance, it hides an enormous potential without interfering with your regular play. Its integrated sensors and capabilities won’t affect you at all. As we said, it has built-in acceleration sensors (six-axis MEMS sensors) that obtain detailed information from each kick. To find out more how the internal sensor system is build up you might check out this article on cnet. The ball logs the info of one kick at a time, but it automatically syncs wirelessly with the application after each kick. With logged information the app is able to display your detailed kick data and will suggest improvements if possible. It will give you accurate feedback on the potency, trajectory, effect, strike point, spin and accuracy of your ball kicks. Android and iOS will do the trick! To enjoy what this sports gadget give, you need to buy the ball and make sure to have an Apple or Android brand mobile. Initially, miCoach was launched only for iOS devices, which was a bit restrictive especially for non-professional Android users who wouldn´t be prone to invest on the ball and a new smartphone. Nowadays, it is accessible to iOS and Android users equally. According to adidas it requires Bluetooth 4.0 compatibility, iOS7/ Android 4.3 or later. The smart ball connects via Bluetooth with iOS or Android mobile devices so that the information can be checked through the accompanying app. The ball and the free to download app go hand in hand. The ball is the heart, and the app is the bloodstream that nurtures it. You will have no difficulties adapting to the app. When I did this Adidas miCoach Smart Ball Review I noticed that it is very intuitive and user firendly because it presents complex information in simple graphs, figures, and visuals. Don’t think you will have to analyze and understand complex graphs, the app does it for you. The miCoach app does not only provides the static data of each kick but also gives tips and suggestions based on the results of each strike. Yes, just like a flesh and bones trainer would do, you will get instant feedback after each strike. You just get so much more information than you would with just any other fitness tracker. Besides, the app comes with built-in tutorials, coaching tips, videos and challenges, aimed to help the user improve soccer skills. It is not just about information; get tips, challenges, and tutorials too! Additionally, you can keep track of your progress, which will over time show you how effective the smart ball training has been. You can bookmark your Favorite kicks, navigate through your history graphs to view your progress, and your top marks. These features can provide valuable insight to professionals, as well as encourage fans to keep on while having fun. Moreover you could also think about combining this miCoach Smart Ball with the miCoach Speed Cell (tracks GPS data) and the miCoach heart rate monitor for your ultimate data collection. The battery can be recharged in about an hour, and its life is around 2000 kicks or a week time. To charge it you just have to place the smart ball on top of the charging stand and it will charge wirelessly. Definitely, I think the Adidas miCoach Smart Ball can be a helpful training tool for professionals seeking to understand and improve their technique. The feedback they will get in return will highly compensate for the price of the smart ball. Professional soccer players or simple soccer fans will find the investment really worth every dollar. Furthermore, it is also worth it paying each dollar even for common individuals who enjoy soccer. 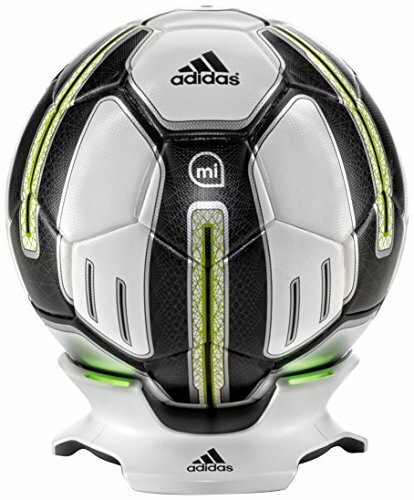 You can find the Amazon link below this Adidas miCoach Smart Ball Review and you will see that you can get it around $ 200. For that price, you will get a typical high quality Adidas soccer ball, plus a digital personal trainer, and a source of fun, and physical activity encouragement. It might also be a perfect birthday present for your soccer addicted kids. Personally, soccer is not my favorite sports, but I tried the ball and had tons of fun challenging myself to improve my scores, and trying to beat my friend´s records playing in the backyard! Yes, a healthy source of digital and sports fun.